Red may be the color that turns heads faster than any other; but, unfortunately, it’s also the color that fades the fastest, too. So we thought it was only fair to give our favorite Gingers their very own shampoo… one that brings on a rosy glow, and puts color-stripping to a screeching halt. 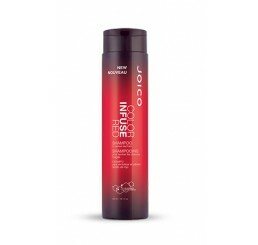 Then we went one better: by adding ingredients that amp up the shine factor and put frizz to shame. Perfect choice for: Any shade of red… color treated or au naturel. Color Infuse never discriminates. Here’s how: Easy-as-pie (cherry pie, that is): Just wet hair thoroughly; lather, rinse, and repeat if necessary. The inside secret: Multi-Spectrum Defense Complex pairs powerful antioxidants and UV protection to literally anchor color from the inside out; our Bio-Advanced Peptide Complex repairs and prevents future damage for up to 25 shampoos. Blondes aren’t the only golden goddesses of the color universe! Now brunettes can share in their gleaming glory with NEW Color Infuse Brown Shampoo & Conditioner, our bold-gold duo proven to instantly infuse light-to-medium brown hair with a gorgeous golden-brown glow. 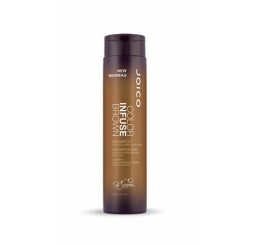 Why You’ll Love Them - Maintain over 89% of color vibrancy even after 10 washes - Instantly refresh golden-brown tones + enhance golden highlights - Tone-enhancing pigments last through multiple shampoos - Proven to reduce breakage by more than 40%* - Multi-Spectrum Defense Complex™ helps protect color against fading - Bio-Advanced Peptide Complex™ delivers root-to-tip repair + protection for healthier hair with every use - Boost color vibrancy + shine *Against combing breakage on damaged hair vs. a non-conditioning shampoo.